* This post is in partnership with GP Sport. All opinions are my own. GP Sport is available at Nordstrom but is at risk of being eliminated at Nordstrom due to cutbacks on smaller accounts. GP Sport owner’s daughter Faith wrote a heartfelt letter to Pete Nordstrom asking him to continue with their brand. As a dance & gymnastics mom myself, I am all about supporting this brand and what they stand for! Their current Unicorn line is a hit with my 3 girls and is perfect for their day to day activities as dancers! Girl Power Sport has a singular, simple belief: girl power can change the world through kindness, by giving back to the society which allows them to compete. The Power to Play. The Power to change. The Power to thrive. Also check out their 1 minute video of their Girl Power story! GP Sport was so generous to sponsor a giveaway one of their new unicorn active dresses! To enter Follow Girl Power Sport on Instagram visit GP sport at Nordstrom and comment below which item you would choose if you win? Winner will be chosen in one week! 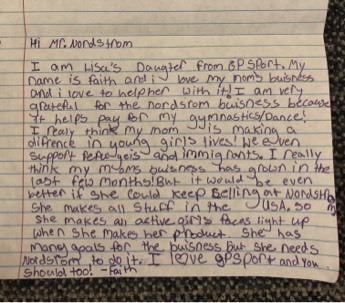 7 Responses to "GP Sport is available at Nordstrom + GIVEAWAY"
My youngest daughter loves unicorns that she even did a project about it and made it convincing that it i real. She believes that they are our miracle animals. The dress that my daughter loves the most is the Halabaloo, but also is interested in gym gear. Love all this company stands for! Here to support for it! GP Sport is amazing! The patterns are the cutest! The unicorn active dress is perfect for summer, especially in Las Vegas. My daughter’s favorite animal is a unicorn (she thinks is a real animal!) We would loooove to win this! My girls are also obsessed with all things unicorns and this line is perfect for girls.